“We need to invest in prevention to ensure the health and economic future of our state,” says Celia Neavel, MD, director for the Center for Adolescent Health at People’s Community Clinic in Austin. Unfortunately, sharp funding cuts in state family planning services and changes in the state’s Women’s Health Program threaten women’s access to vital preventive services, say Texas physicians in the July issue of Texas Medicine magazine. They say the situation is a crisis, and they want lawmakers to restore money to programs that provide low-income women recommended screenings and birth control. The state budget for family planning services plummeted from $111.5 million last year to $37.9 million this year, including federal funds. The Texas Department of State Health Services (DSHS) can now fund only 40,000 to 60,000 women at 143 clinics, a significant decrease from serving 220,000 women at 300 clinics last year. As a result, many clinics can no longer offer contraceptives at a discount, and preventive screenings are no longer free. 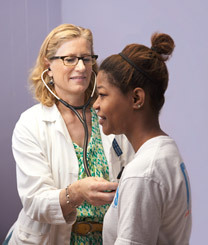 Kimberly Carter, MD, an Austin obstetrician-gynecologist, says, “The most effective way of preventing unplanned pregnancy is ensuring women have access to birth control.” Sixty-two percent of pregnancies in Texas women aged 15 to 44 are unplanned, according to the National Campaign to Prevent Teen and Unplanned Pregnancy. Forty-three percent of unplanned pregnancies end in abortion nationwide. Based on reductions in family planning services, approximately 20,000 additional Texas women will give birth within the next year, says Dr. Carter, costing taxpayers $98 million. That’s $25 million more than the total state and federal dollars saved from the family planning budget cut. Additionally, teen mothers are more likely to drop out of school, remain unmarried, and live in poverty. “If we don’t fully fund family planning services, we need to be prepared to budget for more prisons, additional neonatal intensive care unit expenses, more special education teachers, and other resources to care for children who are the products of unplanned pregnancy. If we don’t pay for preventive services up front, we have no choice but to pay for the consequences on the back end,” says Dr. Carter.